Recent North Korean Defections: Is the End Near for Kim Jong Un? North Korean leader Kim Jong Un speaks during the first congress of the country's ruling Workers' Party in 36 years, in Pyongyang, May 6, 2016. 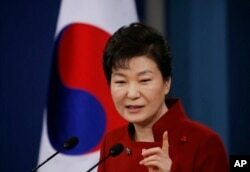 South Korean President Park Geun-hye tried to make the case this week that increasing North Korean defections are signs of growing instability inside the secretive, authoritarian state. On Tuesday, the South Korean Yonhap news agency reported that the South Korean coast guard on August 7 picked up three or four North Koreans on a boat in the Yellow Sea who requested asylum. Last week, Thae Yong-ho, the deputy ambassador of the North Korean embassy in London, fled to South Korea with his family. South Korean media have also reported the defection of another diplomat in Russia, but the Seoul Unification Ministry has not confirmed it. This is an image taken from video taken on April 5, 2004 of Thae Yong Ho, North Korean diplomat speaking during an interview in Pyongyang. 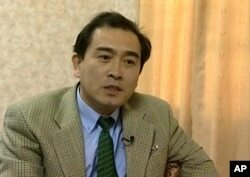 North Korea diplomat Thae Yong Ho who was based in London has defected, according to South Korean officials. While meeting with her National Security Council on Monday Park said increasing high-level defections from the North indicate that dissension and dysfunction inside Pyongyang is approaching a critical level. FILE - South Korean President Park Geun-hye answers to a reporter's question during her news conference at the Presidential Blue House in Seoul, South Korea, Jan. 13, 2016. “Recently even North Korea's elite group is collapsing, followed by key North Korean figures defecting to foreign countries, showing a sign of serious cracks with chances of shaking the regime higher," said Park. Some regional analysts support the president’s claim that Thae’s defection is a symptom of a growing cancer of discontent within Kim Jong Un’s inner circle. “It is a result of reckless management in the regime and may result in a series of additional movements in the future,” said Cho Han-bum, with the Korea Institute for National Unification. However other analysts say it may be premature to predict the imminent fall of the Kim government. “I don’t see any other indicators of the coming collapse of North Korea or any major instability in North Korea,” said Moon Chung-in, a political science professor with Yonsei University. New and stronger United Nations sanctions imposed on North Korea for this year's nuclear test and rocket launches have been in place for six months now. But so far it is difficult to assess the effectiveness of these restrictions, which are intended to increase economic pressure on the North and further isolate the country’s elites. “We are still in the early stages to conclusively argue that sanctions have been working or sanctions have not been working,” said Bong Young-shik with the Yonsei University Institute for North Korean Studies. Soon after the sanctions were imposed, 12 waitresses at a North Korean restaurant in China defected to South Korea. China, as North Korea's most important trading partner, has tried to pressure its ally to give up its nuclear program without undermining the stability of the Kim Jong Un government. “I don’t think there is any clear sign that the Xi Jinping government of China is ready to pull the plug on North Korea,” said Bong. Beijing’s sanctions enforcement have reportedly reduced vehicle traffic at the Sino/North Korean border, the suspension of currency transfers to North Korean banks, and increased inspections of North Korean vessels entering Chinese ports. But there are also reports that food and fuel prices in North Korea remain stable, indicating the economic effects of the sanctions have, so far, not been crippling. 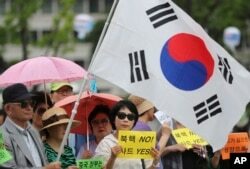 South Koreans hold signs and a national flag during a rally to support a plan to deploy an advanced U.S. missile defense system called Terminal High-Altitude Area Defense, or THAAD, in Seoul, South Korea, July 18, 2016. At the same time, relations between Seoul and Beijing have grown increasingly strained over the deployment of the American THAAD missile defense system in South Korea. Foreign ministers from China, South Korea and Japan are meeting this week in Tokyo to address North Korea, Beijing’s concerns over THAAD and other regional security issues. There have been past high-level defections that also prompted speculation of discord inside the North’s leadership, and after the death of the current leader’s father, Kim Jong Il in 2011, some Korea watchers thought the government in Pyongyang would soon collapse. While it is difficult to predict if this time defections and sanctions will lead to the fall of Kim Jong Un, President Park’s critics say a sudden collapse in North Korea may not end in the peaceful unification scenario she often speaks about. “Instability in North Korea leading to collapse can be extremely violent, chaotic and traumatic, and I really don’t think it will lead to a peaceful unification,” said Professor Moon.